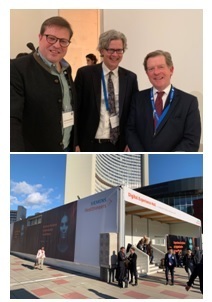 I arrived late on thursday and went directly from the airport on invitation of my friend Prof. Mathias Goyen (CMO, GE Healthcare Europe) to a customer event at the Leopoldmuseum. Prof. Michael Forsting, IT Director (!) and Chief of Radiology of the University Clinic in Essen was one of the panelists discussing AI in practice and hospital. Quite interesting point of views and outlooks. I also had the pleasure of chatting with Kieran Murphy the CEO of GE during that event. AI is almost not worth mentioning anymore ... we are now at the point were it is expected and necessary that AI and related data analytics are a MUST and no longer an option. So needless to highlight the new AI programs and applications and also needless to mention that there were plenty of new companies that showed their dedicated programs and solutions (Artificial Narrow Intelligence) that somehow need to be implemented into the workflow and that also need to be reimbursed. Challenges for these small companies, especially since we all know that AI IS HERE TO STAY, but the revenue situation for them is not solved yet. ECR is certainly gaining attractiveness shown by the increasing number of attendees and the increasing booth space. GE expanded into the back of their normal location, SIEMENS HEALTHINEERS had an extra DIGITAL EXPERIENCE HALL outside the normal exhibition area, and GUERBET rented space in an adjacent building accompanied by human-powered bike-Rikschas.